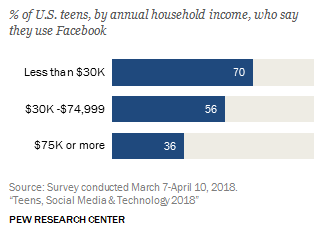 A Pew survey of teens and the ways they use technology finds that kids have largely ditched Facebook for the visually stimulating alternatives of Snapchat, YouTube, and Instagram. Nearly half said they’re online “almost constantly,” which will probably be used as a source of FUD, but really is just fine. Even teens, bless their honest little hearts, have doubts about whether social media is good or evil. Twice as many teens reported being “online constantly,” but really, it’s hard to say when any of us is truly “offline.” Teens aren’t literally looking at their phones all day, much as that may seem to be the case, but they — and the rest of us — are rarely more than a second or two away from checking messages, looking something up, and so on. I’m surprised the “constantly” number isn’t higher, honestly. When asked whether social media had a positive or negative effect, teens were split. They valued it for connecting with friends and family, finding news and information, and meeting new people. But they decried its use in bullying and spreading rumors, its complicated effect on in-person relationships, and how it distracts from and distorts real life.